The 250-member Mission of Long-term and short-term observers headed by former Ghanaian President John Kufuor said in its five-page Preliminary Declaration on Sunday 29 March 2015, that the “shortcomings” require remedial action by the Authorities to further enhance the credibility of the electoral process. “Notwithstanding these shortcomings, the organization of the election can be considered as generally acceptable,” the Mission said in the 22-point Declaration. The challenges highlighted by the Mission included the Card Reader malfunctioning in some polling stations, especially in the finger print identification of voters resulting in the resort to the use of manual accreditation of voters; insufficient and/or non-availability of electoral materials like ballot papers, indelible ink and incident forms in some polling stations; late arrival of electoral officials and materials; and delay in the voting process. “The Mission regrets the violent incidents that occurred during the electoral process in some parts of the country which in some cases led to the loss of lives,” and expressed its condolences to members of the families of those who lost their lives. It commended the enthusiasm, maturity, patience and sense of civic responsibility demonstrated by the electorate, and expressed the hope that the same spirit of respect for order and discipline will characterize the rest of the electoral process. The Mission noted the generally high voter turnout, with voters displaying commendable level of patience, discipline and organization, and laudable participation of women and young people, and urged voters to maintain their high sense of responsibility and tolerance during the remaining election period. It called on the relevant authorities to take necessary measures to avoid similar occurrences in the future. 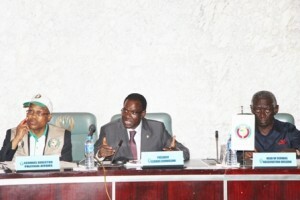 In response to questions from journalists, the chief of ECOWAS poll observation Mission explained that the Declaration represented preliminary observations since the elections were continuing in some parts of the country on Sunday, while the governorship and State Assembly polls come up on April 11. Other dignitaries that graced the occasion included the US Under-Secretary for African Affairs Mrs. Lynda Thomas-Greenfield, ECOWAS Ambassadors and Observers including Member of the ECOWAS Council of the Wise. The ECOWAS poll observers were deployed in five and Nigeria’s six geopolitical zones – (North Central, North-West, South-East, South-South, South-West), while the West African Peace building Network (WANEP), one of ECOWAS’ Civil Society Organization partner, provided updates on the North East geo-political zone to the ECOWAS Situation Room. The ECOWAS election observation chief and President Ouédraogo observed the electoral process in Abuja. He also met with Heads of the other international observer groups including the Commonwealth, the European Union (EU), African Union the International Republican Institute (IRI), the National Democratic Institute (NDI), the International Federation of Election System (IFES) as well as the Head of the UN Office in West Africa (UNOWA), Dr. Mohammed Ibn Chambas.